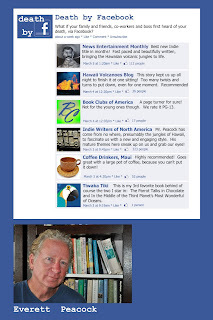 everett.peacock.com: Good Review for "Death by Facebook"
Good Review for "Death by Facebook"
This is an unusual book. Not really what I was expecting, but not in a disappointing fashion, quite the opposite. I was expecting a crime novel, fast paced but rather shallow, not at all what I was given in these pages. The beginning is intriguing, with a sense of lurking darkness amid its seemingly light banter. As the story progresses , the gloom grows along with the impending danger posed by a suddenly active volcano. That's another unusual aspect of this novel, the atmosphere. It takes place in an idyllic Hawaiian island, full of all the images we've grown so used to: the coconuts, the gleaming ocean, the tropical heat. We follow Janet, the unstable heroine, or villain, as you choose. We watch her come in and out of sanity until her actions lead her to a terrifying decision. The novel's action takes a while to get started but once it does, around the second half of the book, it doesn't stop. It is cunningly paced, leaving the reader breathless at just the right moments. Of course, there are faults, grammatical errors, missing punctuations, etc. There is also a bit of a strange shift of perspectives, especially in the second half, where Jimmy, the main male character and the catalyst to the whole story, is no longer included in the narrative and yet we've seen everything through his eyes up to that point. He reappears at the final scenes, but it seemed a bit forced. We'd followed Janet for so long without mention of Jimmy, that we'd kind of forgotten about him. That said, I found myself sad when I ran out of pages and I can easily recommend the novel to pretty much anyone. Beauty and that Beast - "Death by Facebook"
The Head Lamp Crew from "Death by Facebook"
Master Ukulele Player from "Death by Facebook"